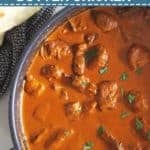 Have you always wanted to know how to make Indian butter chicken at home? Well now you can with my super easy Butter Chicken recipe. Ready in 30 minutes, and delicious served on white rice with garlic naan on the side. Plus, prepare the spice mix in advance and it’s even quicker! You know that amazing feeling at the end of a long week, when you are sitting at home on the couch with the whole weekend ahead of you and the biggest decision you are faced with is what to order in for dinner? Well, when you live in the middle of nowhere with no possibility of having any sort of takeout delivered, you’ve gotta get a bit creative. Because we miss the luxury of takeaways on a Friday night, I’m slowly working my way through the list of our favourite takeout meals and recreating them at home. It’s not quite the same, but that’s what you get for living in the boonies! 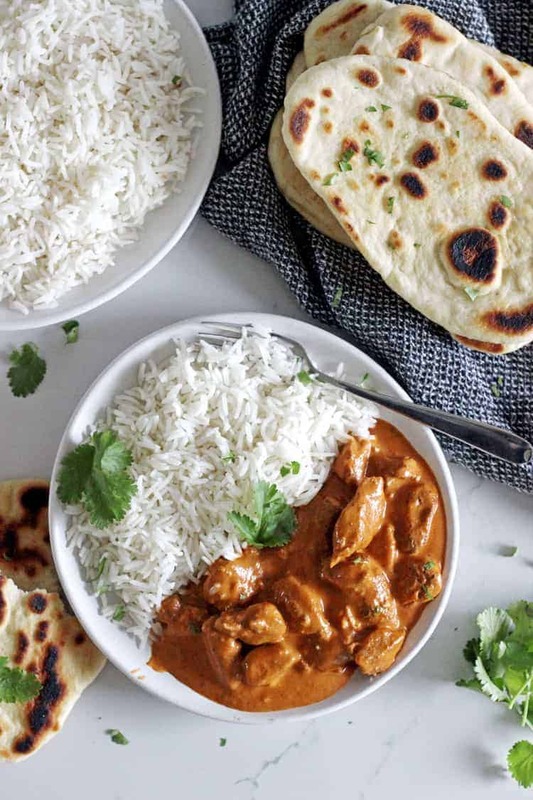 This is my version of the Indian takeaway classic, and one of our favourites – butter chicken. You are going to LOVE it!! 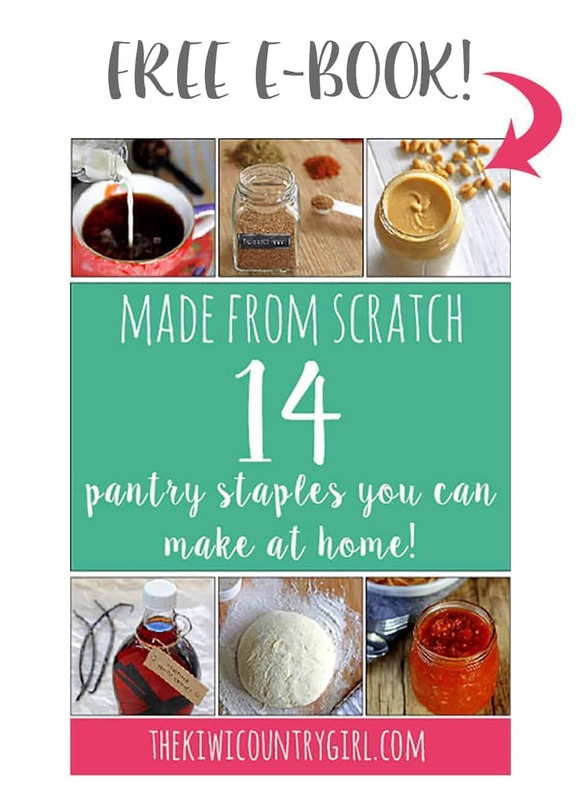 While it may not be totally authentic, it’s a super simplified recipe and is so quick to make! And both Josh & I think it’s as good as any we’ve had from an Indian place and so much better than any sauce that comes from a jar. There is no marinating involved – mostly because I always get mad when I’m frantically looking for inspiration at 5…ok 6pm and come across a recipe that looks perfect except that I needed to start it 4 hours ago. 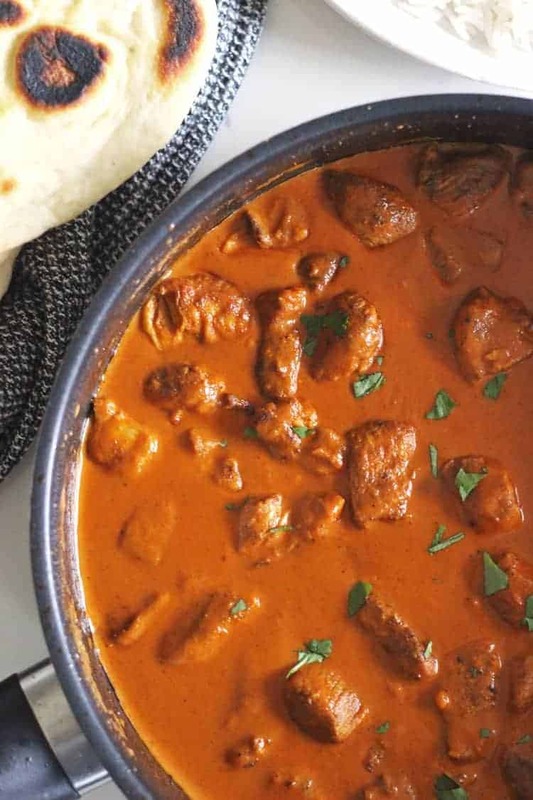 The other amazing shortcut with this recipe is that you can make the spice mix up in advance (similar to my Burrito Spice Mix) and keep it in a jar in the pantry so that you can whip up this butter chicken recipe at a moments notice. You know, for those times when your husband calls at 2pm to request curry for dinner, even though you asked him at 7am and got nothing. The instructions for making a large batch of the spice mix are in the recipe notes. 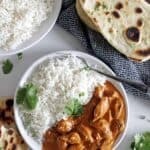 There are quite a few different spices in this easy butter chicken recipe, but nothing fancy and definitely all things you will either have or can buy from the supermarket. The spices are ground coriander, paprika, cumin, cinnamon and the key spice in butter chicken – garam masala. You can also add chili powder but I usually leave it out. I definitely like my butter chicken to be mild. Plus, Sadie is at the stage now where she eats whatever we eat so I don’t want to scare her off certain foods with a bit hit of chili! 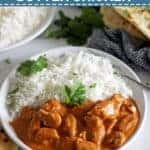 The spices are what pack the flavour punch in this butter chicken so the sauce is a simple combination of tomato paste and water with cream added at the end to thicken it and create that amazing luscious, silky sauce that we all love. Plus a knob of butter thrown in for good measure…and because it’s butter chicken right? 🙂 The good news is, I’ve also made this with coconut cream and it was just as good, so for anyone out there who is dairy free, you don’t have to miss out! You can also just skip the butter at the end. 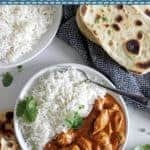 Easy Homemade Butter Chicken has become a staple at our house – it’s definitely not the healthiest meal option but it’s quick, easy, super flavourful and the perfect option for homemade takeout! And on a Friday, who cares! Made this? Tag me on Instagram @thekiwicountrygirl and hashtag it #thekiwicountrygirl. 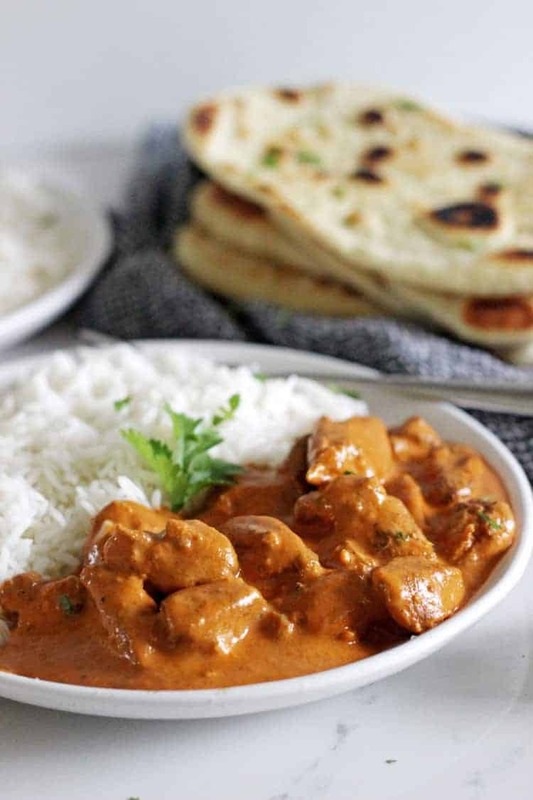 Have you always wanted to know how to make Indian butter chicken at home? 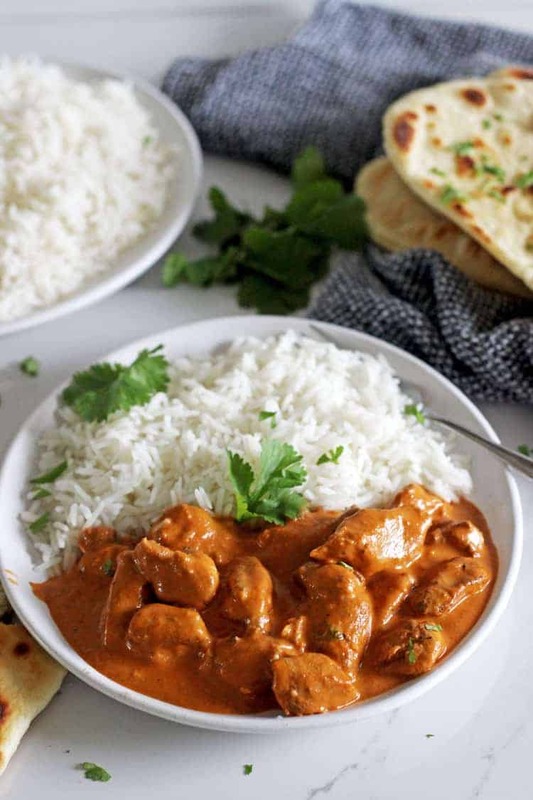 Well now you can with my super easy Butter Chicken recipe! Ready in 30 minutes, and delicious served on white rice with garlic naan on the side! Place the chicken pieces in a medium sized bowl, add the coriander, cumin, paprika, garam masala, salt, cinnamon and chili powder (if using) and toss to coat the chicken evenly. Heat the oil or butter in a frying pan over a medium heat. Add the chicken pieces and cook for 5 minutes until cooked through. Reduce the heat to medium-low, add the garlic and ginger and cook for another 2 minutes. Add the tomato paste and water and allow to simmer for 10 minutes until the chicken is fully cooked. Stir in the cream and butter and cook for a further 2 minutes until the sauce has thickened. Serve with rice and garlic naan bread. Cover any leftovers and store in the fridge for 2 days. 1. To make this dairy free you can substitute the cream for coconut cream and leave out the butter - it doesn't alter the flavour too much! 2. To make a large batch of the spice mix in advance, mix together 8 tsp ground coriander, 4 tsp ground cumin, 4 tsp paprika, 4 tsp garam masala, 2 tsp salt, 2 tsp cinnamon and 1 tsp chili powder (optional) and store in a jar in the pantry. This will make enough for 4 of the above recipe. When following the recipe, add 2 TBSP of the made up spice mix to the chicken before cooking. If you tried and loved this recipe, please leave a comment and a rating below! This sounds great, could you share how you make up the spice mix and how much you use in a recipe if you have the spice mix premade. Hi Jess! 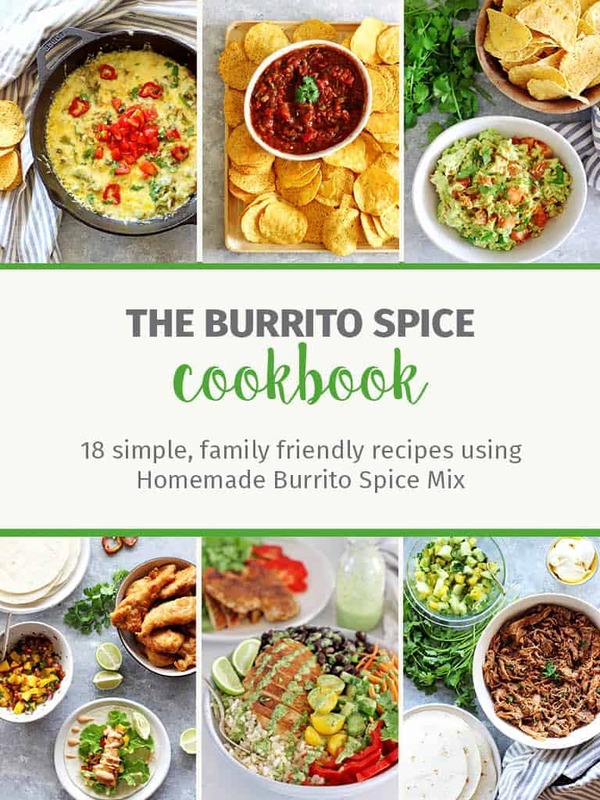 Sure thing – to make enough spice mix to make the recipe 4 times, mix together 8 tsp ground coriander, 4 tsp ground cumin, 4 tsp paprika, 4 tsp garam masala, 2 tsp salt, 2 tsp cinnamon and 1 tsp chili powder (optional) and store in a jar in the pantry. When following the recipe, add 2 TBSP of the made up spice mix to the chicken before cooking. I’ve also added these instructions to the recipe notes, so they will be there if you print it off. Hope you enjoy it! Thank you so much, I will be making that spice mix this weekend.